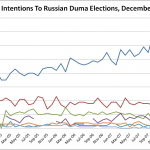 In the aftermath of the 2011 Duma elections, the Russian blogosphere was abuzz with allegations of electoral fraud. Many of these were anecdotal or purely rhetorical in nature; some were more concrete, but variegated or ambiguous. A prime example of these were opinion polls and exit polls, which variably supported and contradicted the Kremlin’s claims that fraud was minimal. But there was also a third set of evidence. Whatever problems Russia may have, a lack of highly skilled mathematicians, statisticians and programmers certainly isn’t one of them. In the hours and days after the results were announced, these wonks drew on the Central Electoral Commission’s own figures to argue the statistical impossibility of the election results. The highest of these fraud estimates were adopted as fact by the opposition. Overnight, every politologist in the country – or at least, every liberal politologist – became a leading expert on Gaussian distributions and number theory. While I don’t want to decry Churov, the head of the Central Electoral Commission, for making subjects many people gave up back in 8th grade fun and interesting again, I would like to insert a word of caution: lots of math and numbers do not necessarily prove anything, and in fact – generally speaking – the more math and numbers you have the less reliable your conclusions (not making this up: the research backs me up on this). Complicated calculations can be rendered null and void by simple but mistaken assumptions; the sheer weight of figures and fancy graphs cannot be allowed to crowd out common sense and strong diverging evidence. Since the most (in)famous of these models asserts that United Russia stole 15% or more of the votes, it is high time to compile a list of alternate models and fraud estimates that challenge that extremely unlikely conclusion – unlikely, because if it were true, it would essentially discredit the entirety of Russian opinion polling for the last decade. In this post, I will compile a list of models built by Russian analysts of the scale of electoral fraud in the 2011 Duma elections. I will summarize them, including their estimates of aggregate fraud in favor of United Russia, and list their possible weak points. The exercise will show that, first, the proper methodology is very, very far from settled and as such all these estimates are subject to (Knightian) uncertainty; but second, many of them converge to around 5%-7%, which is about the same figure as indicated by the most comprehensive exit poll. This is obviously very bad but still a far cry from the most pessimistic and damning estimates of 15%+ fraud, which would if they were true unequivocally delegitimize the Russian elections. 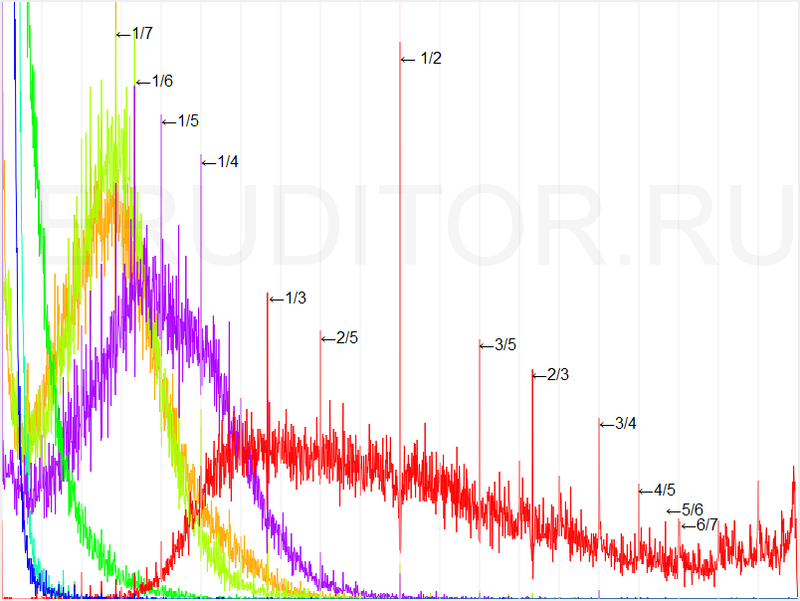 The long-time elections watcher and phycist Sergey Shpilkin (podmoskovnik) has probably written the most popular article on the use of statistical analysis to detect electoral fraud. The first piece of evidence of fraud is that as turnout increases, so does United Russia’s share of the vote; the effect is not observed for the other parties, whose share remains constant or even declines. Below is the graph for Moscow. 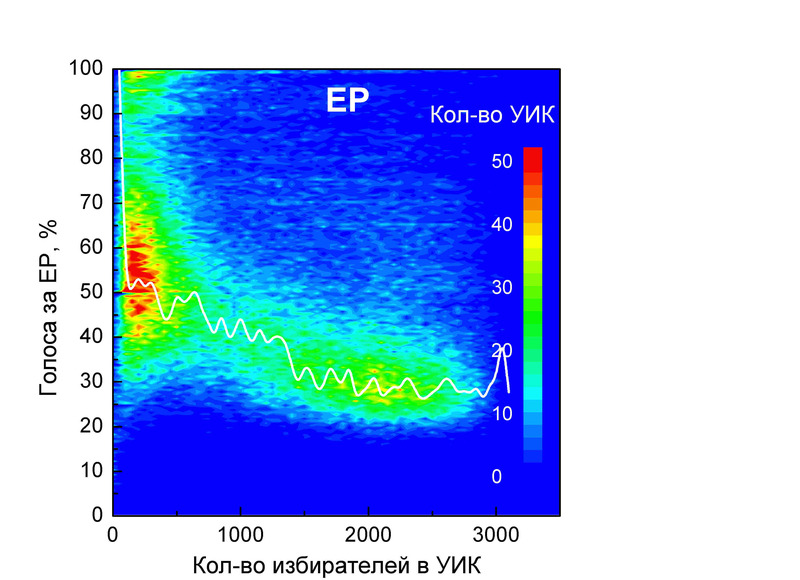 And below, courtesy of Maxim Pshenichnikov (oude_rus), is the same graph as a “heat map” for all Russia. But that’s not all. A second problem is that turnout in Russia does not follow a normal, or Gaussian distribution. The laws of probability dictate that if you throw a coin 100 times, it is fairly unlikely that the “heads” will turn up exactly 50% of the time; however, as you repeat this experiment a dozen, a hundred, and then a thousand times, the average should converge to 50%. A graph of all these experiments should be in the form of a bell curve, with a peak at the midway point and falling away rapidly on either side. Theoretically, this should also hold for turnout, and this is in fact what we see in for elections in countries such as Mexico, Bulgaria, Sweden, Canada, Poland, and Ukraine. 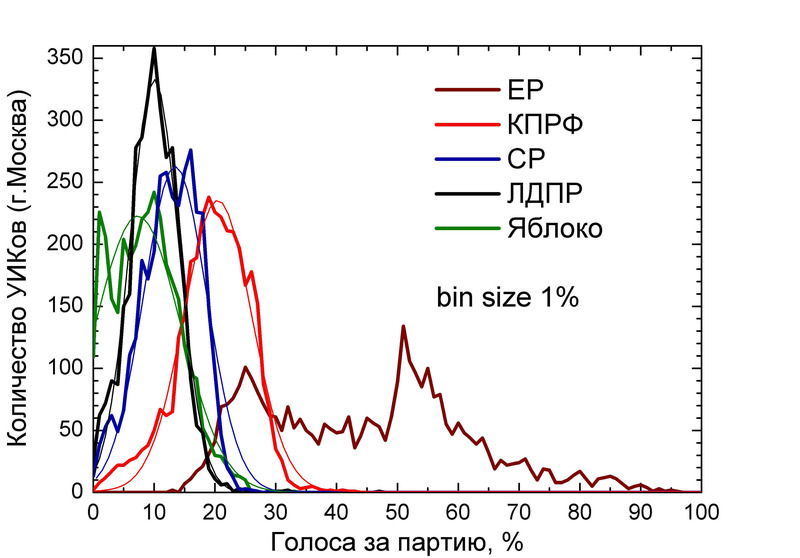 As we can see, there are suspicious peaks at 100% turnout in some of the less developed democracies like Ukraine, Bulgaria, and even Poland; and Ukraine’s Gaussian distribution breaks down beyond about 90% turnout altogether. 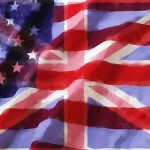 Nonetheless, the overwhelming indications are that all these countries conduct almost fully free and fair elections. But these laws do not seem to apply to Russia, including for the most recent Duma elections. Not only does the normal distribution break down on the right hand side of the graph, from about the 60% turnout point, but there begin to appear consistent peaks at “convenient” intervals of 5%, as if the polling stations with 70%, 75%, 80%, 90%, and 100% turnout were working to targets! Though the most recent election seems marginally better than the 2007 Duma election and the 2008 Presidential election, the overall indication is one of rampant shenanigans and fraud. And in Moscow, United Russia’s curve looks even more ridiculous. The twin peaks that Yabloko has are either because their vote was stolen at some places and not at others, or they did not have a proper Gaussian to begin with. (Note how practically all the Moscow polling stations with machines cluster at around 30% for United Russia, strongly indicating that the second, bigger peak at around 50% is falsified; see these two clusters in more graphic form here). 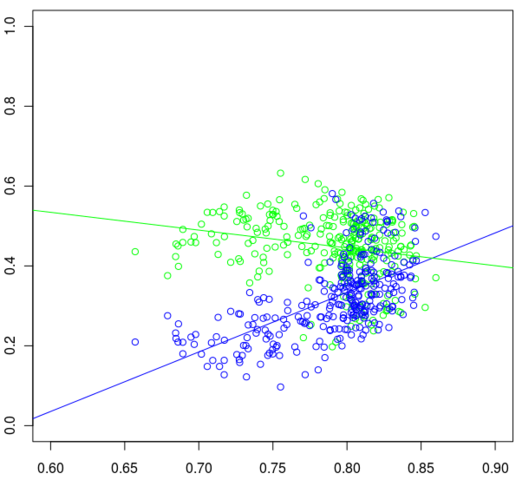 Then there’s the matter of abnormal turnout patterns. Cui bono? Quite clearly, United Russia. 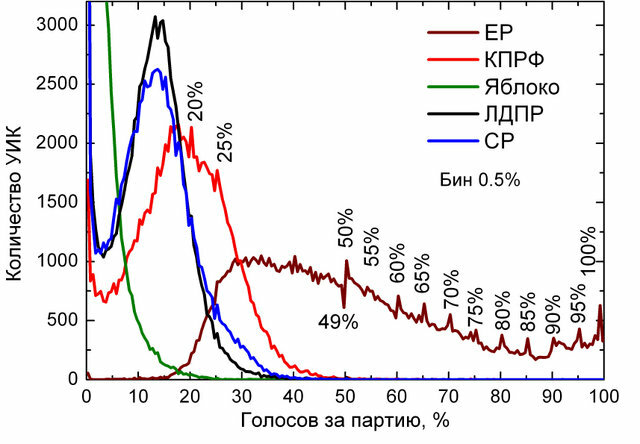 Returning to Shpilnikov’s work, as you can see below, the higher the turnout, the greater the relative discrepancy between votes for United Russia and the opposition parties. 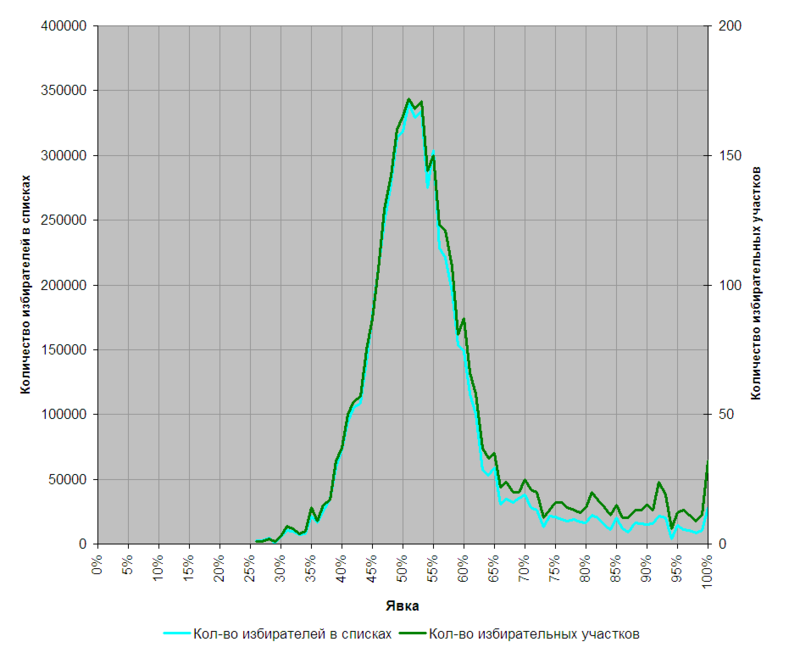 The author then proceeds to “normalize” United Russia’s results, making the blanket assumption that the correlation between high turnout and higher votes is entirely due to fraud and that it is valid to extend the correlation between votes for United Russia relative to the other parties observed for stations will turnout lower than 50% to every other polling station. Its adjusted results vastly differ from its official results, with the numbers of falsified votes soaring once turnout at any individual polling station exceeds 50% and rapidly converging to near total falsification once turnout rises to 70% and above. At this point, it is possible to “integrate” the adjusted results curve, to calculate United Russia’s real result. The conclusions are devastating. According to Shpilkin’s final calculations, cited by GOLOS, out of 32 million votes for United Russia, only half of them – some 16.2 million – are “normal”, whereas the other 15.8 million are “anomolous.” This means that in reality it only got 33.7% of the vote, as opposed to the official 49.3%, implying a 15.6% degree of fraud. This would clearly make the Duma elections illegitimate, as the will of the Russian electorate – a truly multi-party parliament – is not reflected. If the elections were fair, United Russia would lose its majority and have to rely on coalitions with other parties to pursue its legislative agenda. It would appear that the non-systemic opposition has a clear mandate to demand a rerun. Not so fast. This claim of 15% fraud is contrary to the entirety of Russian opinion polling, which generally predicted United Russia would get 50%, and to the results of the most comprehensive exit poll, which gave it 43%. 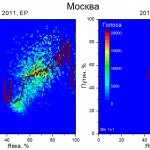 Furthermore, as other bloggers rushed to point out, Shpilkin makes many highly questionable assumptions that challenge the credibility of his estimates, for instance, he doesn’t back up his claim that the correlation of higher turnout with more votes for United Russia (and is in fact contradicted by electoral patterns in advanced democracies like Germany and the UK). PS. You can read an alternate explanation of this method in English by Anton, a Russian blogger living in Finland. The mathematician Sergey Kuznetsov wrote a long piece at eruditor.ru attempting to rebut Shpilkin’s conclusions. He starts off by pointing out that the Gaussian distribution achieved by conducting multiple coin tossing experiments is artificial because conditions remain identical. The same cannot be said if some of the experimenters continue tossing coins, while others of their kind begin to favor using dice with “heads” on five of their faces. Likewise, in a country with many socio-economically and culturally idiosyncratic regions such as Russia, Gaussian distributions are not inevitable. As for the peaks at 5% intervals, they are products of elementary number theory. There must be a jump at 50% because the fraction 1/2, among other fractions n/m, appears more frequently than any other. The same can be said for other “nice” fractions: 2/3, 3/4, 4/5, and so on. Not only fraudsters like these “beautiful” fractions; its an intrinsic property of number theory itself. 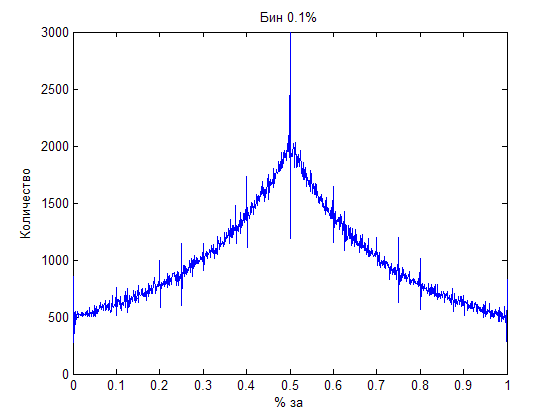 This is demonstrated below by Ruslan Enikeev (singpost), who built a frequency distribution of the natural outcome of multiple elections with 600 participants; as you can see below, there are very prominent spikes at all the “nice” fractions. And guess what? If we are to build Pshenichnikov’s graph in “The Magical Beard” but at much finer resolutions, like Kuznetsov did, we get the following. Note how the other parties also get their spikes at “nice” fractions! So you say that a correlation between higher turnout and more votes for United Russia means mass electoral fraud? If that’s the case, Britain must be a banana republic. 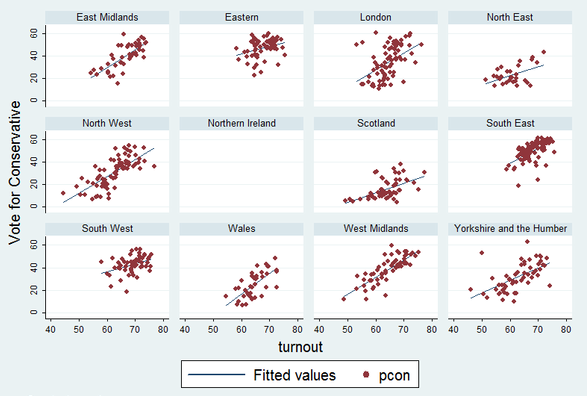 Below is the relation between turnout and votes for the Conservatives and New Labour in the 2010 general elections (and this pattern is common to every British region). Nor are British voters big fans of the Gaussian distribution either. PS. 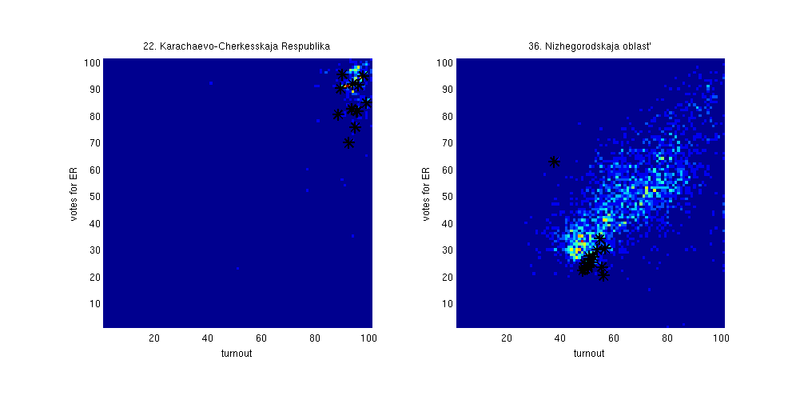 At this point, I should also note that I observed lots of small peaks for the 2007 Ukraine elections (i.e. after its Orange Revolution) in this blog post. That said, it should be noted that Kuznetsov acknowledges that the fat tail, and some of the 5% intervals that cannot be explained by number theory – e.g., 65%, 70%, 85%, 90%, 95% – means that a lot of fraud probably did happen. PS. This has been pretty much confirmed by bloggers such as gegmopo4 (“Happy Pictures“) and Dmitry Kobak (“Party of Scoundrels and Thieves and 10 Sigma“). The Reichstag Is Burning Since 2002! The programmer Sergey Slyusarev (jemmybutton) also gave his two kopeiki on election fraud. He pointed out that as in the UK, the turnout for the 2002 Bundestag elections did not follow a perfect Gaussian either; in particular, a lower turnout in East Germany contributed to a second, smaller peak to the left of the main one. He also notes that higher turnouts correlated with more votes for the conservative alliance and fewer votes for the social democrat / green alliance. Just as Kuznetsov above, he also discussed how pure number theory can explain most of the peaks along 5% intervals. However, even after making adjustments for it, there remained peaks at 75%, 85%, and the fat tail in general that he could not explain as being natural. 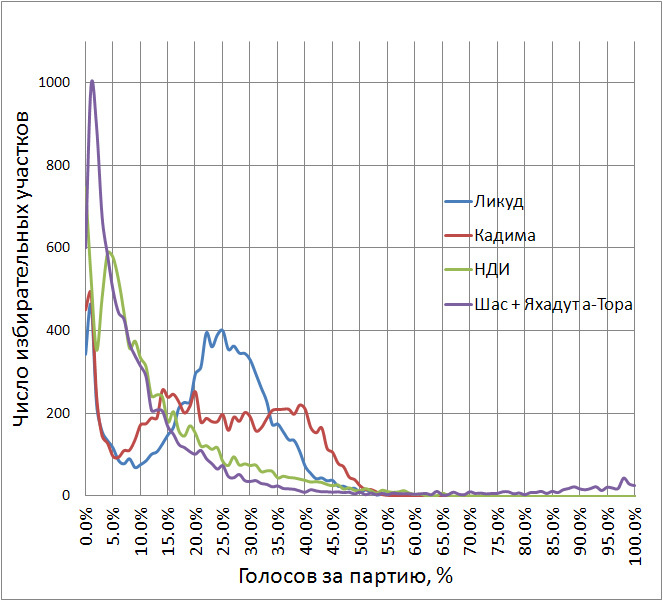 I would add that that is understandably so, if we consider this graph of North Ossetia’s results from Pshenichnikov. The biggest irony is that they didn’t even HAVE TO do it to ensure a big United Russia win. The “natural” Gaussian for UR (from the few free and fair stations) seems to be only a few percentage points short of the artificial peak. There’s idiots and then there’s bureaucrats. He goes into further really wonky elections stuff later on in his post. There are no firm insights or conclusions arising from it, so I’ll refrain from summarizing it. The blogger, and aspiring Sinologist Vitaly Shishakov (svshift) doesn’t have original models, but does have a lot of useful links. He gives further examples of countries where higher turnouts result in more votes for certain parties and of where turnout does not follow Gaussian distributions. One example is Israel, where Arab turnout in local elections is consistently, stunningly higher than in Jewish ones. As both are still in significant part traditionalist societies, one wonders if the same applies to the Caucasus states (a possibility I raised in my Al Jazeera article). Read him here and here. The blogger levrrr does not believe that there is significant electoral fraud in Israel; and he agrees with Dmitry Kobak that this is patently not the case in Russia. Nonetheless, the curious patterns observed in the 2009 elections in that socio-culturally diverse society are a good reminder that just because it looks strange doesn’t necessarily mean surreptitious activities are afoot. Unlike in many other countries, the distribution of voting stations by the percentage of votes each party obtained in them is most definitely not standard. Yisrael Beiteinu is log-normal; Likud is a Gaussian with two peaks (like Yabloko in Moscow); Kadima is kind of Gaussian but with a huge plateau; and the two fundamentalist parties (Shas and United Torah Judaism) have a weirdly long and fat tail. So no wonder Avigdor Lieberman is virtually the only foreign statesman to approve of Russia’s elections! Comparing it to Pshenichnikov’s graph of Russia, there are striking comparative resemblances: Yabloko resembles Shas; the LDPR and Fair Russia resemble Yisrael Beiteinu; the KPRF resembles Likud; and apart from the spiked tail, United Russia looks like Kadima. 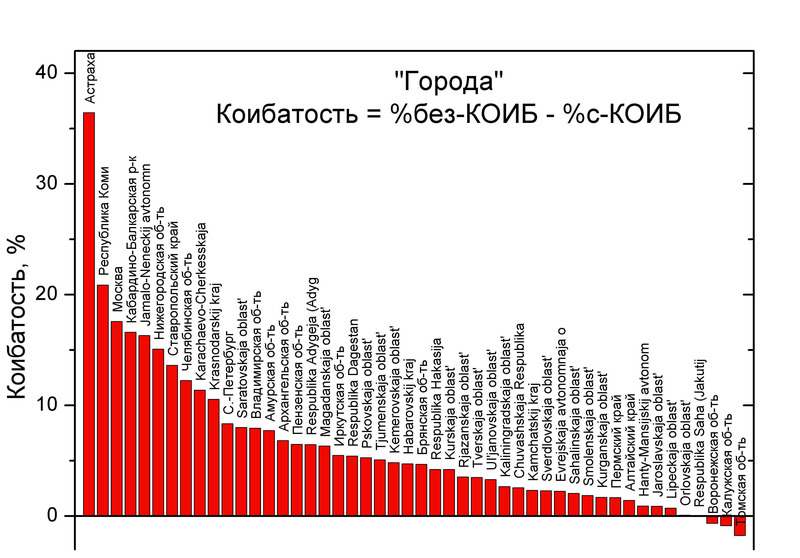 Like United Russia, the higher the turnout, the more votes Kadima gets, as in the graph below. The effect is neutral for Likud (as for the Russian opposition parties), and it is negative for Yisrael Beiteinu. Nonetheless, Israel’s turnout is an indisputable Gaussian; there is no separate peak for the Arabs. (I would note that they have ultra-high turnouts only for local elections, not national ones). Less than 0.1% of polling stations saw a turnout of more than 95%, whereas this figure is more than 5% for the recent Russian elections. I assume that’s almost all fraud, as there are only so many barracks in Russia where everyone goes to vote en masse. The economist Sergey Zhuravlev (zhu_s) argues that the correlation between higher turnout and higher votes for United Russia is meaningless because of the “silent majority” effect. Voters for the opposition can be expected to turn out in full force, whereas people without any specific grievances against the “party of power” – who expect it to win with or without their participation – can turn out at varying rates in different regions, depending on their satisfaction with its performance and its success at mobilizing its supporters. As for United Russia’s unusually long tail, that can be explained by the very fact of its getting many votes. A party like Yabloko whose support base hovers in the lower single digits can be expected to have a very narrow peak at the beginning; a party like United Russia, which enjoys a great deal of supports with large geographic variation, will naturally have a far wider spread. He outlines an alternative method that involves plotting the growth of each party’s share of the vote against the numbers of polling stations giving them a certain level of support. In a society where there are no regional differences in voting preferences and no falsifications, the graphs for each party can be expected to converge to a vertical center. In real life, regional differences flatten out this “ideal” vertical form, especially at the top and bottom. This is because both many stations with little support for a particular party, and the few stations with high support for a particular party, contribute only a small share of the votes to that party; most of its votes accrue to the many stations where support for that party is not far from the national average. This method eliminates the “flattening effect” observed in Shpilkin’s work where the mere fact of high popularity makes United Russia’s spread look unnaturally wide. As we can see below, all parties have substantial spreads in regional support; they are just on different scales. 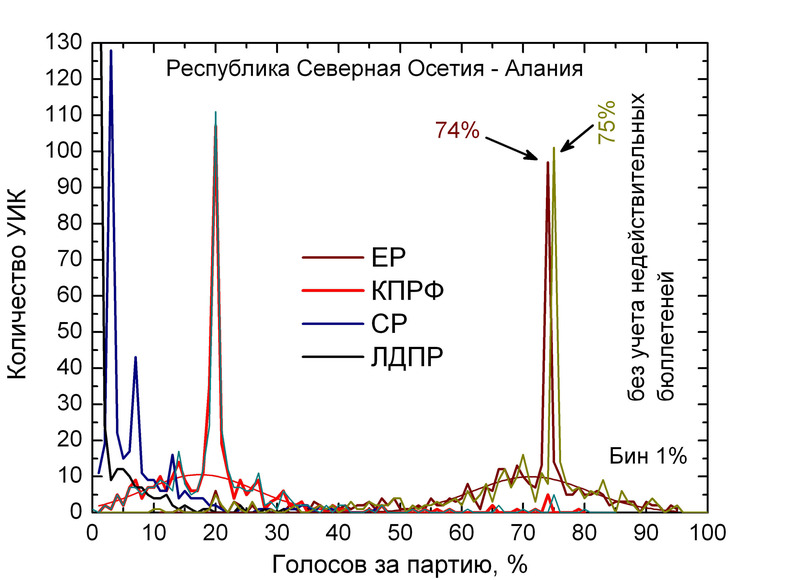 From the graph above, United Russia is seen to enjoy an “S-effect”, in which stations where they got more than 70% – concentrated in the ethnic minority republics – contributed one fifth of its total vote; the kinks observed in that region are especially suspicious and indicative of mass fraud. 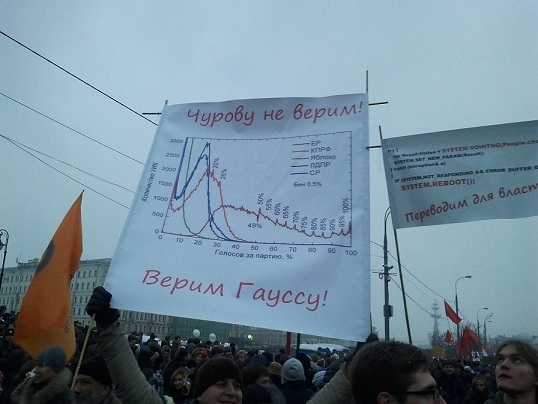 This “S-effect” took away votes from the Communists and LDPR, creating an analogous “J-effect” at the bottom of their graphs. Yabloko too has an “S-effect”, if much lower in overall scale relative to United Russia, due to its relatively good performance in the two capitals; elsewhere, it is now just a forgotten relic of the 1990’s. Whereas there is much evidence of fraud in Moscow, Zhuravlev has some of the strongest evidence against it as shown in the graph below. United Russia has a very natural curve, with no kinks observed at the at the top-right; instead, it has a “J-curve” at the bottom, presumably in the hipster Moscow districts with high support levels for Yabloko (a thesis corroborated by Yabloko’s prominent S-curve). To resolve the possible falsifications arising from the S-effects and J-effects (with the caveat that they are not always indicative of fraud – e.g., Moscow with its Yabloko-friendly hipster districts), Zhuravlev suggests taking the median: i.e., the party voting shares such that half the polling stations have lower numbers and the other half have higher numbers. This effectively cuts out the S-effects and J-effects. The result is that United Russia loses 6% points relative to its official results, leaving it marginally below a Duma majority with 220 seats. Of course, this approach too has its problems. It seems to me that kinks are only going to be observed where results are “drawn to plan” (as in some of the ethnic minority republics); where fraud is decentralized, the degree of fraud will itself be a wide spread, and as such not reflected in kinks or S-curves. His conclusion that fraud in Moscow was minimal contrasts with a whole heap of contrary evidence. Zhuravlev expands on his thoughts on falsifications and the economics of political choice in a follow-up blog post. The Election Results: An Analysis of Electoral Preferences by Vladimir Churov. This isn’t the first time the head of the Central Elections Commission, a physicist with some Petersburg connections to Putin, has had to dodge incoming bullets from the election nerds and LJ malcontents. In response to criticisms of the last round of elections, in 2008 he co-authored an article in an attempt to rebut the critics. His basic approach is to explain the idiosyncrasies of Russia election patterns in terms of voter behavior. At the beginning, he brings forth the standard criticism against the view that voter behavior must necessarily conform to normal distributions, i.e. it’s not a uniform series of experiments but the choices of a heterogeneous population we are talking about. The authors then proceed to build a model of electoral preferences for Russia’s different population groups in a quest to see how well it conforms with reality. Unlike everyone else on this list, he is analyzing the Presidential election of 2008, but that’s fine because according to Shpilkin it was one of the most falsified. As shown in the graph above, rural polling stations and urban polling stations reveal starkly different voting patterns. I can see that the latter is described by an (almost internationally standard) log-normal curve; rural voters are the ones who create the fat tail. The other polling stations are various special ones, e.g. in closed institutions or the military, but only account for 1% of the total voters so their overall effect is small. The difference between turnout in the cities and the country is explained “deeper and stronger mutual relations” existing in the latter, whereas urban dwellers are a more amorphous mass. And I would remind the reader at this point that United Russia is more popular in the countryside. At some level this does make sense – anybody who has lived in a Russian village (or even a small town) can confirm that people there know each other far better than in a big city or a metropolis like Moscow. I can easily imagine a social activity like voting will logically draw a higher participation. 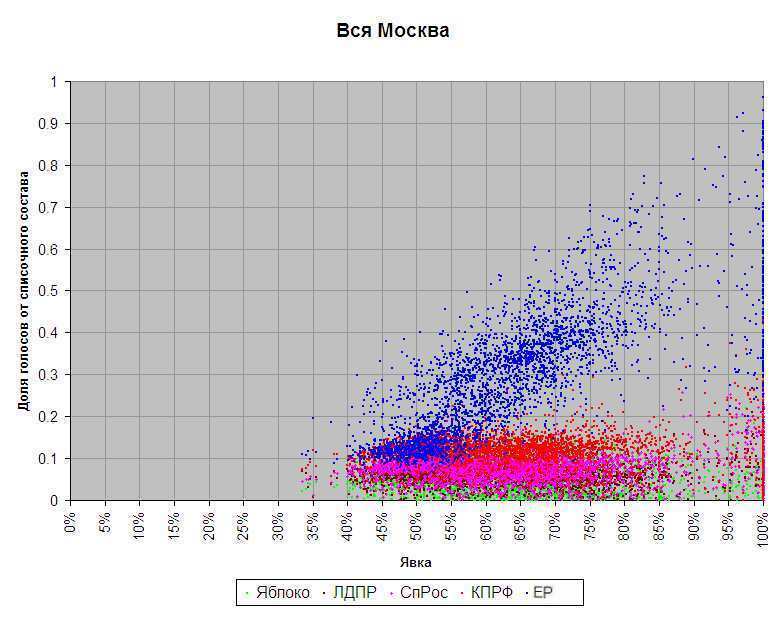 He makes a further interesting argument regarding the relation between turnout and the size of the voter list at polling stations (see “Size Matters, Baby” below for a nice graph by Pshenichnikov illustrating this). Basically, turnout at urban polling stations with smaller voter lists begins to converge to converge with results from rural polling stations with bigger voter lists; but unlike in towns, the vast bulk of votes in rural areas accrue to polling stations with small voter lists, where turnout is very high. And though there are fewer rural voters than urban voters, the number of polling stations is about evenly split between the two – because the average rural polling station has a smaller voter list than the average urban polling station. 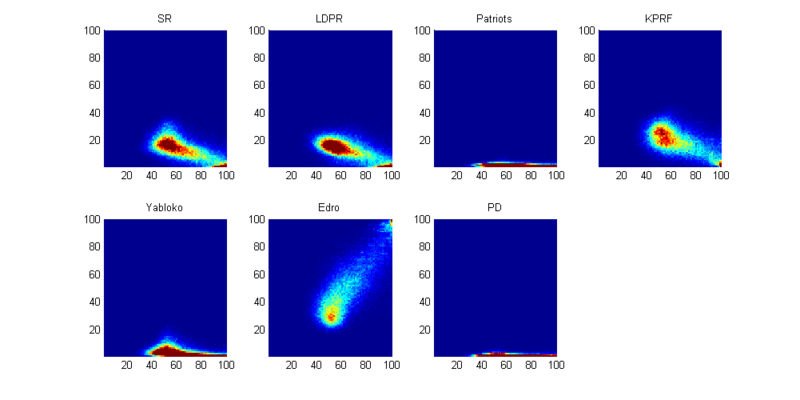 Adding the results from city stations and rural stations together produces the fat tail on the turnout graphs. 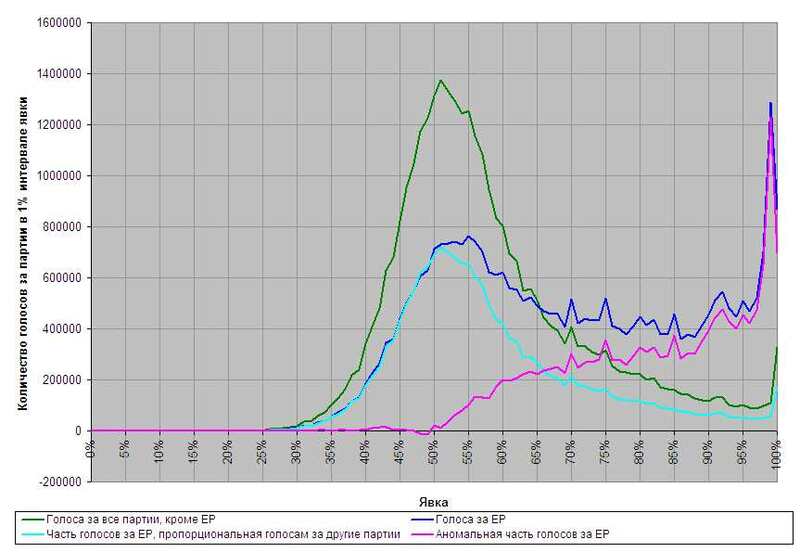 In summary, the overall turnout distribution by polling station is merely the sum of how different Russian population groups vote: urban voters, rural voters, institutional voters (e.g. soldiers). Worried about the “cragginess” of the graph? Just the result of ordinary fluctuations. 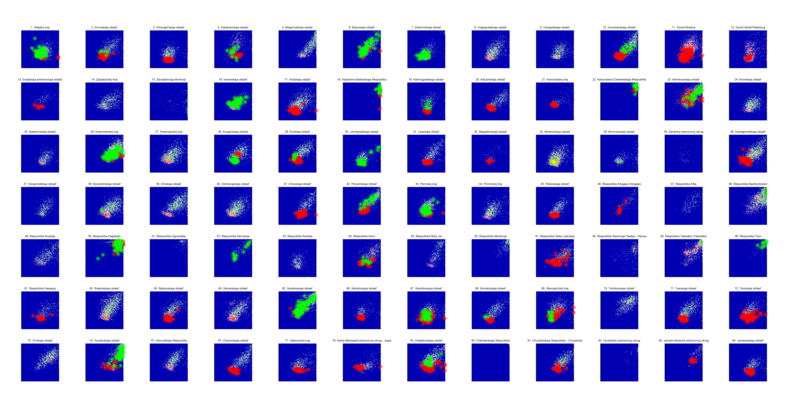 It increases when you analyze it at higher resolutions and fades away to nothing at the lowest resolutions. Plotting the voter turnout distribution not against the number of polling stations but against the number of voters voting in places at any particular turnout will naturally diminish the fatness of the tail (because as pointed out above the polling stations with small voter lists will have the highest turnouts). As before, the same general turnout pattern is observed in terms of rural and urban voting patterns when plotted against voter numbers. Churov further argues that the proportional votes for each candidate are NOT huge affected by the turnout. What tendency Medvedev has to win more votes relatively at higher turnouts is down to the increasing influence of the rural vote. A close up of the voting figures for the 75%-100% is presented. As far as I can see, Churov makes an important point (and in large part convincing) point about the different voting patterns that describe rural and urban voters, and especially the effect of the size of the polling station’s voter list on the turnout. However, he patently fails to address the main concerns of his critics for one simple reason. He only analyzed the results from 25 regions of European Russia. Which ones? They are not even identified (apart from Kaliningrad, Murmansk and Arghangelsk oblasts, and the Nenets autonomous region, which are mentioned in passing as included). If there is a link telling us what the other 21 are, I cannot find it. And the biggest problem is that, of course, fraud is highly variant by Russian regions. For instance, see Aleksandr Kireev‘s (kireev) map of his estimates of election fraud. Note that three of the four regions actually cited by Churov are green, i.e. indicating that they had little or no fraud in the 2011 elections. As Russian political culture hasn’t changed much in the past three years, they presumably looked similar in 2008. I strongly suspect that for his analysis Churov merely handpicked the most electorally honest regions he could find and worked from there. Why else include only the 25 regions, with 21% of Russia’s voters and 23% of its voting stations, when he obviously has access to the Central Election Commission’s entire database just like any other blogger? These suspicions are further reinforced by the lack of spikes at regular 5% intervals that everyone else who compiled turnout distributions at the federal level found. He makes some good arguments but the overall conclusions that there is no or minimal fraud is not credible. The computer programmer hist_kai takes a relatively simple approach. He plots the number of people voting for United Russia under every 0.1% point interval to get the graph below. Then he removed all voices for United Russia at 5% intervals, in a 0.5% swathe left and right. This gives a level of fraud of 0.7%. Then he removes all polling stations where United Russia got more than 75%. This gives a total fraud level of 7.3%. This is highly unscientific, of course. Some polling stations where United Russia got less than 75% would have been dirty, and some where it got more than 75% would have been clean. Still, it’s a useful way to demonstrate that even removing all the places where it got huge amounts of the vote would have only modestly impacted United Russia’s total tally and would have still clearly left it as the biggest winner. 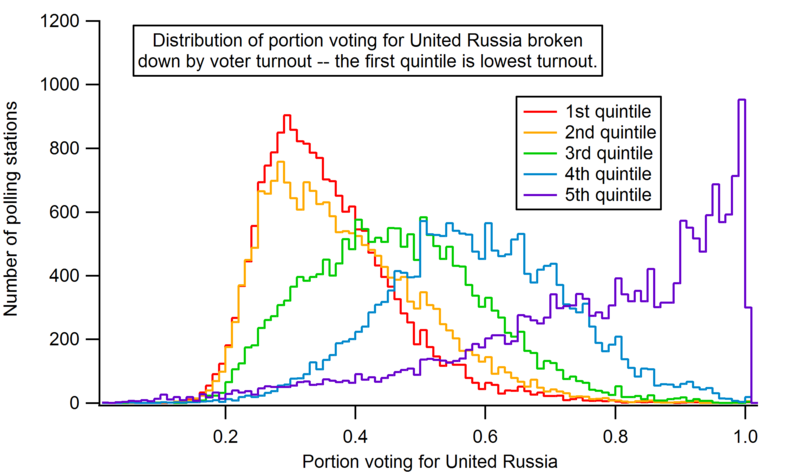 A group from Samarcand Analytics (Alex Mellnik, John Mellnik and Nikolay Zhelev) issued a study using the a similar method to hist_kai, though they cut off the top quintile of turnout as opposed to all stations registering more than 75% support for United Russia. They justified this on the basis that it was only the quintile with the highest turnout that voted for United Russia in a spectacularly non-Gaussian distribution. Despite the methodological problems with this relatively crude method, it’s worth noting that the adjusted results by party are highly congruent with the results of the FOM exit poll, the most comprehensive one. There are very significant and suspicious discrepancies between polling stations with machine voting and polling stations were counted by hand. The former, on average, are a lot lower. Across the same territorial electoral commissions, United Russia got an average of only 36.6% at polling stations equipped with voting machines; this is compared to its 54.2% result elsewhere. This would seem to indicate huge fraud, as machines are harder to tamper with. But this is only assuming that there is no consistent difference between polling stations with and without voting machines. But this may not be merited as urban, more accessible areas can generally be expected to have a higher likelihood of hosting voting machines, and they are also precisely the places where United Russia has done less well in these elections. On the other hand, if both machines and hand ballots are falsified – e.g. as seems to be the case in Karachay-Cherkessia – this indicator would be a false negative. In a joint project, Maxim Pshenichnikov and Dmitry Kobak (kobak) compiled a list of disparities between machine and hand ballot results in each of Russia’s cities. They return substantially smaller estimates of overall fraud, albeit there are huge differences between regions. The average calculated by Pshenichnikov is 6.3%. This figure he termed “коибатость”, i.e. 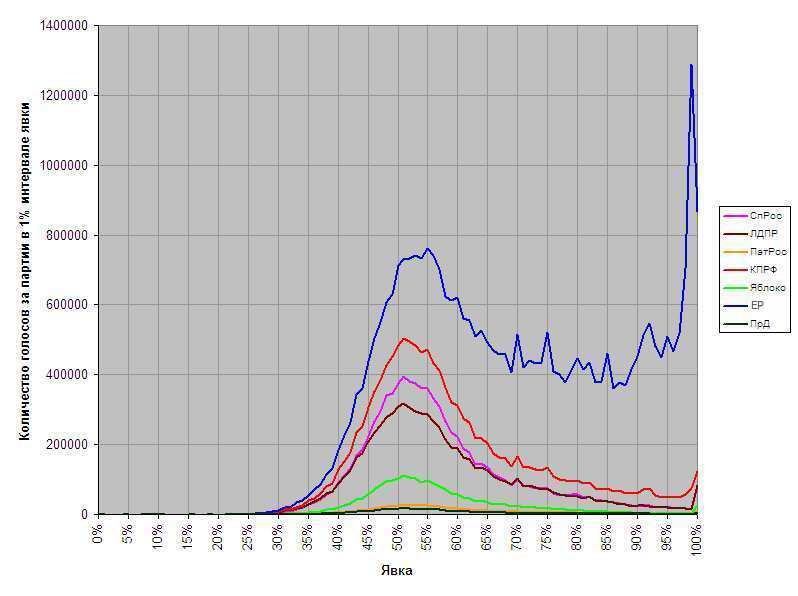 which we may translate as “machination.” As you can see in the graph below, the city with the highest measure of fraud – as measured by the machine / hand ballot discrepancy, which has its methodological problems – is Astrakhan, with more than 30% fraud in favor of United Russia. In third or fourth position follows Moscow, with slightly less than 20% fraud in favor of United Russia. The average calculated by Kobak is 6%-7%. His method is slightly different from – and more rigorous than – Pshenichnikov’s, because whereas the latter calculated “global” machination he confined himself to “local” machination, i.e. he only used the statistics from those polling stations which had at least one voting machine for his comparison with the results from voting machines. 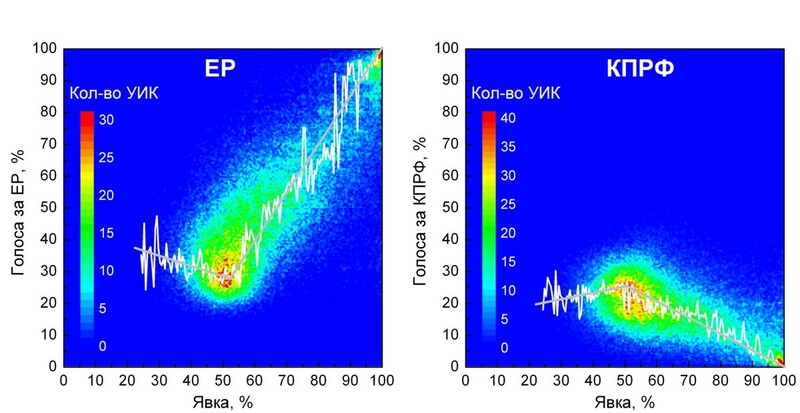 Apart a histogram similar to the one above also produces this stunning map of machine and hand ballot voting in Russia’s urban regions: The “green meteors” are results from hand voting, the “red meteors” (which aren’t usually near as trail-blazing) are the results from machine voting. Kobak is unsure as to why the big discrepancy with Shpilkin’s figures. He emphasizes that Shpilkin’s 37% figure for United Russia cannot be taken at face value because machines tend to be present in larger cities where United Russia does less well; but does consider the 17% figure (the federal average) an important estimate, despite its being much different from his own 6%-7% estimate (the average by region). One theory he suggests is that in even in those regions where United Russia has a high results, there are few machines and many individuals sites are without them; there, the difference between hand voting and machine voting results is modest at 7%. But when counting up these results on the federal level, these high-United Russia support regions only contribute a little to the aggregate total at well below their true weight (because few of them have machines and can be counted); while contributing a lot to the hand voting totals. Hence the possible source of the huge (and “misleading”) 17% discrepancy. Dmitry Kobak (kobak) is another big skeptic of the official results. 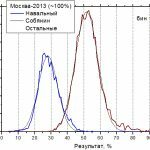 Like Shpilkin, he considers the turnout / voting correlation in favor of United Russia damning, and has some nice graphs to illustrate it. For an election to be fair, the meteors have to be flying to the left and their trails have to be horizontal – a condition that United Russia fails to fulfill. See above for extensive criticism of this assertion. He calculates the real result by cutting away all the data from polling stations with “suspiciously high turnout”, which he puts at anything bigger than 60% or 50%. Due to United Russia getting far fewer votes in places where turnout is low, that has the effect of reducing its result from 49.3% to 36% and 34%, respectively. Needless to say his graphs look nice, but they hide a very crude method. Cutting off at 60% essentially dismisses half the entire electorate. He addresses this concern by taking the minimum of United Russia’s voting curve in relation to the turnout, then sums the results up to get a real score of 38%. This implies 11% fraud. This seems more realistic than the 15%+ obtained by Shpilkin, which clashes so badly with the results of exit polls and opinion polls, if still towards their absolutely lowest margins of error. And needless to say the fairness of taking United Russia’s minimum – and assigning anything above it to fraud – is highly questionable. Using the regional turnout and voting data for the 2010 UK general election provided by _ab_, would the same method not “prove” massive fraud in favor of the Tories? He also reproduces Shpilkin’s normalization method, producing a real result of 34% for United Russia and hence fraud of 15%. However, even he rejects the method as too harsh and simplistic, ignoring local specifics. His analysis of the applicability of Benford’s Law to the Russian elections saw no interesting results. Maxim Pshenichnikov points out that the larger the amount of voters at any polling station the lower a result United Russia tends to get there. Is it because fraud is harder when there are more people? Or is because smaller stations would probably tend to be in rural and more remote areas, which are usually more pro-United Russia? He doesn’t comment. You decide. That the correlation between higher turnout and more votes for United Russia is indicative of fraud has two main arguments against it, as we saw above: First, the logic of the “silent majority”, and second, comparisons with other countries like the UK, Germany, and Israel. 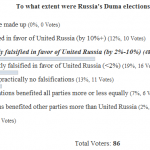 The blogger vmenshov attempts to prove that this “silent majority” thesis does not apply to Russia, and that the effect really is down to vote stealing on United Russia’s behalf. So Is It Time To Get The Barber? 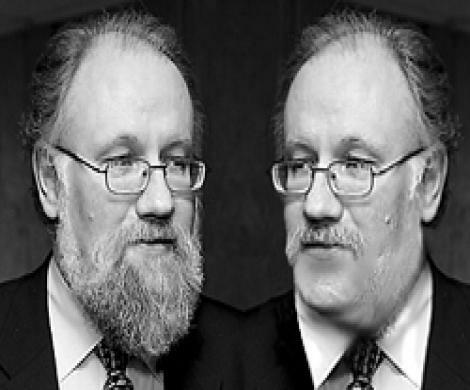 Back in 2007, Churov promised to shave off his beard if the elections were unfair. Should we send him the barber then? It’s a hard question. That there is statistical evidence indicating some degree of fraud is beyond dispute. What’s at stake is the scale. Much like United Russia’s results in Moscow, there are two big clusters: I will simplify them to the 5% Thesis and the 15% Thesis. (There is also a 0% Thesis, as argued by Churov and Kremlin spokespersons; not as if they have much of a choice on the matter. But I think most of us can agree that just the results from Chechnya alone discredit this group). The 5% Thesis is maintained by Sergey Zhuravlev and the aggregate regional discrepancies between districts with and without machine voting; it is also the figure suggested by practically every opinion poll and exit poll. The 15% Thesis, most prominently advanced by Sergey Shpilkin and Dmitry Kobak, has become the banner figure of the opposition. If they are right the current composition of the Duma does not reflect the will of the Russian electorate and as such the elections have to be honestly rerun for the system to win back its legitimacy. 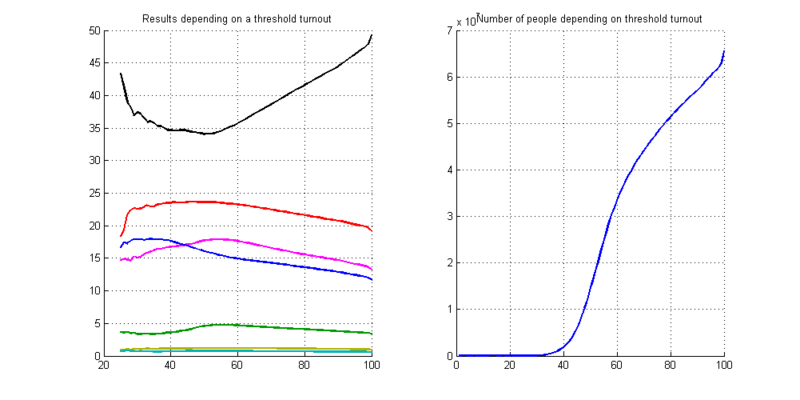 The lack of a “normal” Gaussian turnout and voting distribution. 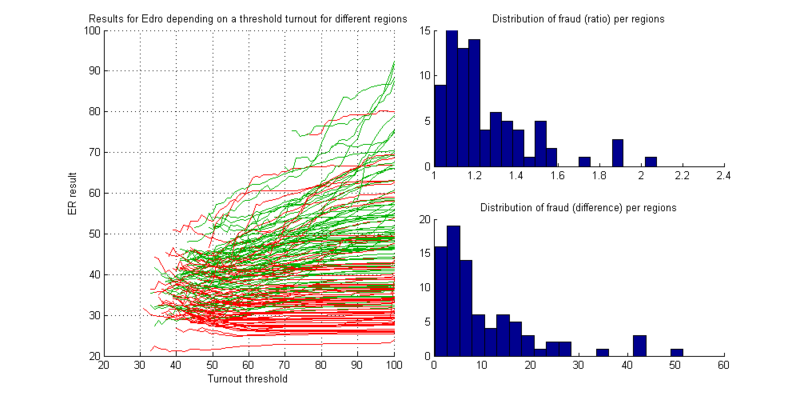 Suspicious spikes at regular intervals in the turnout and voting distribution. 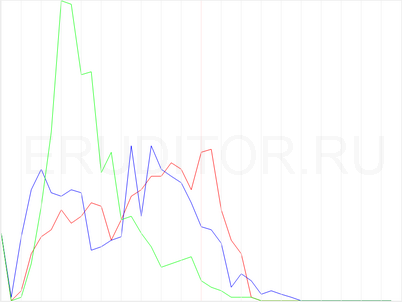 A positive correlation between turnout and votes for United Russia. A heterogeneous population and examples of similar phenomenon from advanced democracies throw doubt on this argument, BUT none have tails quite as fat or spikes quite as sharp as does United Russia. The spikes may, in part, be a product of number theory. But as turnout rises above 60%, they become too sharp to be attributed to number theory alone; and besides, number theory can only explain spikes at common fractions, not at places like 85% or 95%. The thesis of the “silent majority” and myriad examples from other countries severely weaken this assumption. It’s good that this election has inspired bloggers, activists and scientists to delve into the interesting and undeveloped world of electoral fraud analysis. They may well be truly groundbreaking original research on the subject lurking somewhere on Runet. Nonetheless, there remain huge uncertainties; one must guard against the deceptive simplicity and aesthetic richness of most of these arguments. A further peril is that, understandably, this discussion is extremely politicized. As a rule, proponents of the 15% Thesis are liberals to whom United Russia really is a party of scoundrels and thieves and Putin is a cancer on the nation. Likewise, all proponents of the 0% Thesis and some of the proponents of the 5% Thesis are more politically conservative and sympathetic to the Kremlin’s viewpoint that things are basically alright. My own view on the matter is that the 15% Thesis is extremely unlikely to be true because if it were valid, it would essentially invalidate the entirety of Russian opinion polling – and the work of hundreds of experienced professionals – for at least the last decade; prior to the 2011 Duma elections, only a single poll gave United Russia less than 49%. And we are expected to believe their actual result was 35% or even less? A claim this extraordinary needs truly extraordinary evidence to be credible, but the evidence that has actually been presented is full of questionable assumptions. Which is, in fact, quite ordinary in the world of social science. Which is not a bad thing. Let the debate go on. Churov can keep his beard, but a web camera or three to let people know he ain’t hiding anything in it wouldn’t go amiss.